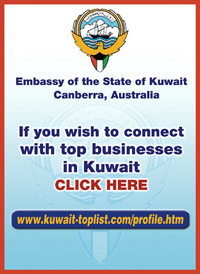 Kuwaiti Amb. 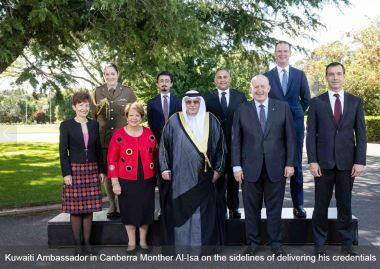 in Canberra submits credentials to Australia gov. 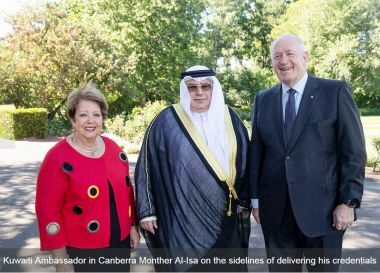 KUWAIT-- Kuwaiti Ambassador in Canberra Monther Elissa has submitted his credentials to Australia's Governor-General Sir Peter Cosgrove. This came during a ceremony held at the governor-general's palace, the Kuwaiti Embassy said in a statement to KUNA. 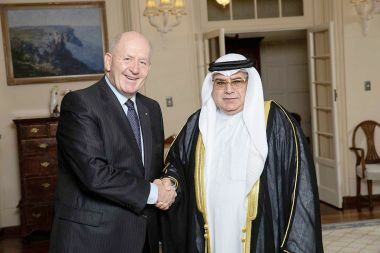 During the event, the Kuwaiti ambassador conveyed the greetings of His Highness the Amir Sheikh Sabah Al-Ahmad Al-Jaber Al-Sabah and His Highness the Crown Prince Sheikh Nawaf Al-Ahmad Al-Jaber Al-Sabah to the governor-general of Australia, wishing Australia more progress and prosperity, according to the statement. The ambassador spoke highly of the advanced level of Kuwaiti-Australian relations in various regional and international issues, together with trade, economic and investment cooperation, it added. He commended bilateral relations as "stable, friendly and cooperative" in all domains thanks to the mutual sponsorship of both countries' leaderships, it added.